Authentic camping holidays in Drôme await you! The Yelloh! Village Le Couspeau, which is arranged on natural terraces and which has a wide range of accommodation options, is an opportunity for you to enjoy fantastic views over the region's mountains and valleys. Its aquatic park will be ideal for experiencing some fantastic fun and bathing with the family. Perfectly positioned, the camping Le Couspeau is an opportunity to discover the delights of Drôme, with its wild little rivers, unusual villages, fantastic landscapes and plenty more. 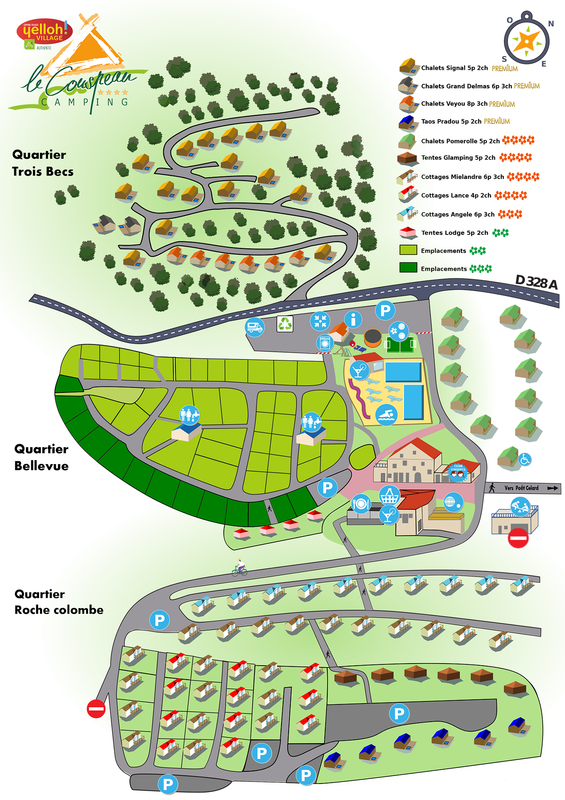 Your camping holidays in Drôme will be truly unforgettable! Fabulous stay in we’ll managed campsite with amazing views. Come and soak up the delights of Drôme! Your holidays at the camping Le Couspeau will be a really authentic countryside break, in the magnificent setting of the mountains and valleys of Drôme. You'll be able to enjoy all sorts of outdoor activities, including mountain biking and bathing in an untamed little river… The possibilities are endless! When you walk around the camping de Poët Celard, you'll get a little glimpse of the Drôme identity, between the Alps and Provence. Dieulefit and its market with all its colours and scents, Crest with its mediaeval tower, Bourdeaux and its valley, the lovely village of Poët Laval, the forest of Saou and more. So many fantastic places to discover! And you'll be able to enjoy some bathing while staying at the Yelloh! Village Le Couspeau too, with its aquatic park for people of all ages, with a paddling pool, an aqua-recreational area and a heated and covered swimming pool, the whole family will be really happy! You'll even find a counter-current river and a waterslide! Fancy the idea of a bit of water out in the countryside? Just a few kilometres from the campsite you'll find several natural beaches beside the rivers. You'll love your holiday at the camping Le Couspeau, where relaxation, countryside and welcome will be the watchwords for your stay!